Artwork details: gouache, 12.5 x 18.5 inches (32 x 47 cm), 2006. The theme of this painting is something I had thought about ages ago - something along those lines anyway - after all, while pot plants are not all that likely a concept in Hell, if the Devil is down there for an eternity then he's bound to get round to trying out some of the more unlikely activities just to relieve the tedium of having to torment the dammed every day - and it will make the place a little more cheerful, no doubt. Of course it had to be cacti.... I did briefly consider ferns since they grow with very little light - the sort you get half way down wells and so on - but in the end I thought I ought to go with the no-water motif. I was rather pleased with the detail of the cacti spines, so if you scroll down you'll find a couple of close-up images, too. 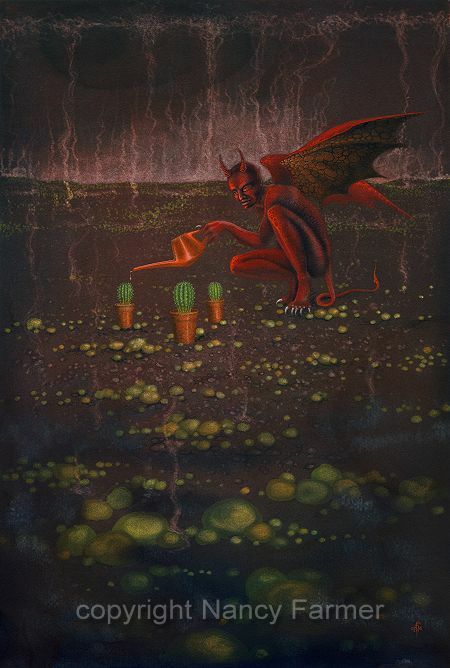 The Devil, watering Hell's few pot plants. The plastic watering can is actually one I own. It came from Boots and I was quite picky about replicating exactly that shade of unnatural orange. I expect they have a Boots in Hell. It would sell a lot of cough mixture, because of the harsh, sulphurous smoky air, and it would be exactly as effective as the cough mixture they sell up here.... only probably not as tasty. An alternative thought occurred to me when I was sketching this one - that maybe instead I could have had a little crack in the ground opening up, with a carefully-tended weed sprouting out of it like weeds out of concrete - but I rather rejected it on the grounds of too much metaphor and not enough silliness - hope springs eternal and all that sort of stuff. 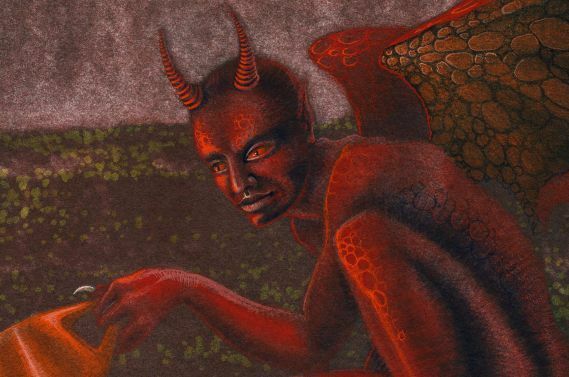 I'm not sure I'm all that big on Metaphor - if I paint a painting of the Devil watering pot plants it is because I intend to show that maybe the Devil has some pot plants that need watering. He might.